Yamaha is proud to present the new Gigmaker Standard. This is a great package that includes an F325 acoustic guitar, gig bag, digital tuner, DVD guitar lessons, strap, strings, and picks. 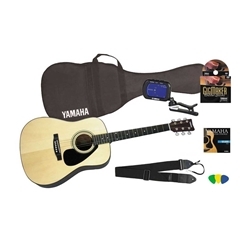 This finely-crafted Yamaha acoustic guitar provides great sound and playing ease. Available by itself or in a complete guitar package (GigMaker Standard).